Once more unto the breach, dear friends…. Let me just shift these tumbleweeds out of the way, I’m sure there used to be a blog here somewhere. Aha! Here we go… Lord, it’s a bit dusty isn’t it? Pass me that duster will you? Give me a moment and I’ll crank up the generator… See the lights flicker – orange, yellow, white and we’re on! Wow. It’s been a while, hasn’t it? We’ve been in the Great Blog Void and fingers crossed, we may be just getting across to the other side. Let’s see, when was the last time I put something up on here…? About a year back I think. Rude! But it’s been a hell of a year. So. I won’t go through the list of joys and woes which have made the last 12 months what they have been but the main points (in chronological order) include: adopting an elderly lurcher in October 2015, who has been a constant source of joy, irritation and laughter, and whose arrival was accompanied by that of a small colony of (empty!) poo bags which have invaded the pockets of every garment I possess. Said lurcher is very beautiful and has his own fanclub in the village, so we are now known as the dog’s owners in much the same way as members of a star’s entourage; basically, we just hold the lead. Bless him. He’s thirteen in April, which is quite old for a lurcher, but thinks he is a puppy still. Given how beautiful he is now, I suspect he was unbearably cute as a pup. My lovely dog…. But, by necessity, once the funeral was over we had to get going again, as our wedding was at the end of July, which kept my mum and the rest of us busy just at that weird point where everything’s done and the madness is over and all that is left is the empty chair and the quiet. The wedding had been designed with the idea of not stressing my Dad out, so it was just the two immediate families in a pub on the moors, followed by roast beef sarnies in a yurt outside the house, and live music by a very talented friend (as well as my sister, a kazoo, the lurcher who apparently knows how to bark in time, etc). I came in to “Bring me Sunshine” by Morecambe and Wise, wearing black jeans, a black and silver corset and a purple coat my mum made from a pattern called “Pirate Queen”, which will tickle anyone who knows about my lifelong penchant for pirates (and I may use that phrase as a title at some point now I’ve invented it). She even put pockets in it. My wedding dress had pockets!! I was very pleased about that. I hate not having pockets. My mum also made some tremendous glimmering blue brocade waistcoats for the blokes, and my new husband looked splendid; channelling his inner pirate, clearly, though that was just incidental. In a surprise move, my mum even made a waistcoat for the dog who, when we put it on for a photo, seemed completely content and wandered off to steal (another) beef sarnie without waiting for us to take it off him again. My sister did the flowers, which were some of the most beautiful I’ve ever seen. The bridesmaids, who had chosen their own dresses, all chose white in different styles, and all looked very stylish and very much themselves. The yurt was magical! We loved the yurt. 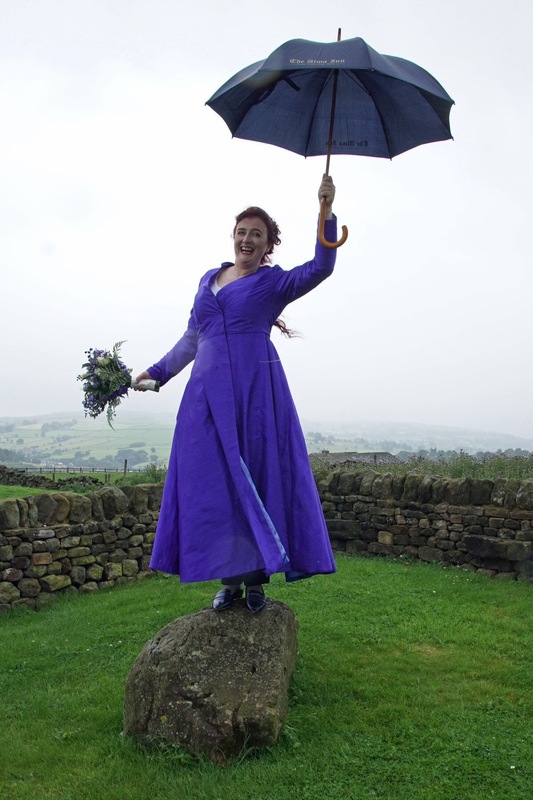 The weather was mizzlish, but this is Yorkshire, and it does mizzle with style – besides which a dull sky actually suits the photos better – it makes all the people look really vivid and there are so many smiles that each photo is pretty sunny in any case. I don’t tend to put up pics of friends or family for reasons of privacy but here’s one of me having been persuaded to channel my inner Mary Poppins. Spit spot! Apart from the missing family members, it was two shades better than I had hoped in pretty much every aspect you could think of. We sang “The Wild Rover” for my Dad, laughed and cried, often at the same time, had splendid local food and drink (ok, mostly, the wine was from Hampshire and the bubbly came from Cornwall), sang and chattered. All the olds got caught up in a vicious competition to see who could blow the biggest bubble (there were bubbles instead of confetti) and in most of the photos, someone appears to be laughing their head off. In any case, I enjoyed every moment of it. It was *such* fun – and about perfect. Then, after that, newlywed life kicked in which as far as I can tell is very much like normal life but when absolutely nothing has got done in the house for about five months. The washing was tremendous and the garden had gone mad. The bathroom doorhandle fell off, the kitchen light stopped working and the downpipe for the rainbarrel was hanging in place apparently only because of the spiderwebs around it, though the same spiders had seen fit to make a massive web of the entire inside of the lean-to where I keep flowerpots and gardening gloves, so I had to fight my way in in with a crystal containing the light of Earendil in order to retrieve the trowel, which Shelob had taken a fancy to. I went back to work and discovered my inbox, which usually holds about 85 items, had hit 1600 in my absence, and started to wonder whether I shouldn’t go back and have another chat with Shelob about that there gardening fork…! And then we ran out of teabags at a critical point (nooooooo!). So, a bit of elbow grease and we’re coming up to date on all of the above… but in the meantime, what of the damn books, which is why we’re here? Weeelllllllll. Now it gets complex. Anyhow, it was all a bit irrelevant in any case, as I was too burnt out for anything in the first half of the year, and too busy sorting out Dad’s paperwork for my Mum. Once I’d got a bit of mojo back after that I went on a reading binge instead, which is always salutary… and then, come the beginning of July, just as the wedding stuff was really hotting up, I dreamed this great character, and it was a bit compulsive. I couldn’t get him and his heroine out of my head and there was stuff to be done, so I figured it was time to make some notes and just download the bugger. BUT these characters are arsey and not inclined to play nicely. Some notes! Yeah right, in the same sense as a map with a scale of 1:1. So by the end of August, these “notes” had taken the form of a 110k word book. At the time of writing, I’m 120k into book 2 and books 3 & 4 are all mapped out. As soon as I get to a sensible stopping place, I’m putting Flight back together and sending it to the editors (with the hope that fresh eyes will be able to sort out the chronology more easily than I can), so with a bit of luck that won’t need too much in the way of rewrites and might be out in early 2017. The new Christmas Lites anthology is due in December. I have a short story (currently 10k) in editing which is a sequel to Sprig of Holly, and when all that is put to bed, Mother of the Shantar is already 85k done, (Shatner, heheheheh) and ready to start culling characters! Man, if I didn’t already have a fulltime job I would be adequately provided with writing hours just from this lot!! So yes, as far as you lot are concerned, I’ve been off the radar for a rather long time with little enough to show on the actual publications page but a short story in last year’s Christmas Lites anthology (though I did help design the cover, which I totally love). But I haven’t let the writing drop – ohhhh nooooo – and I’m hoping the next 18 months or so should bring you the occasional release to remind you who I am. The new lot though, the new lot is looking interesting and this time I’m playing with the somewhat random idea of writing the entire thing before I release any of it, so that in theory you’ll be able to read the entire story arc from start to finish with only a couple of weeks’ wait from one book to the next. If anyone has any thoughts about that, I’d be really interested to hear them. Might be a good plan, might be stupid – no idea at the moment. Just wait till you meet the Wolf and Lyse, though!! I think you’re going to like them…. Well done on the writing. My dad has alsheimers and mum is developing what we hope is carers dementia but we’re not sure. After I’ve dealt with their care, finances etc and driven 280 miles round trip via the delightful M25 to their place and back once a week and been mum to my son there isn’t much left for writing so I hear you re the burn out. But stuff is happening slowly. I’ve done that really annoying thing where you get 45,000 words of something and realise it’s the second book. Gah! Still it’s 45k I won’t have to tweak much next year. Still loving the wedding photos. If it helps, it pissed it down on our wedding day, abd the day after the sun came out, it didn’t rain for three months and we had the hottest summer since records began. Despite the fact we spent it huddled in a tent, I remember the whole day as sunny. Congratulations all round even if some of the joy has been bitter sweet – I’m sorry to hear about your dad. All the best and keep us posted about the new book. Wow. What a year. Sometimes life just seems to happen all at once. Thank you for sharing. Love your wedding outfit. If you need a beta, I’m more than willing. Oh that would be wonderful, thank you! I will absolutely take you up on that!